Dan Abnett is the author of the Horus Heresy novels Horus Rising, The Unremembered Empire, Know No Fear and Prospero Burns, the last two of which were both New York Times bestsellers. 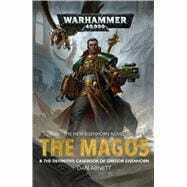 He has written over fifty novels – his other work for Black Library includes the acclaimed Gaunt’s Ghosts series, the Eisenhorn and Ravenor trilogies, and I Am Slaughter, the opening novel in The Beast Arises series. A prolific comicbook writer, he scripted the first Horus Heresy graphic novel, Macragge’s Honour. He lives and works in Maidstone, Kent in the UK.